The rise of China’s economic power in the recent years has brought in rapid development in terms of infrastructure and high-rise building industry. The development has paved the way to extensive display of modern architectural designs and concepts. While this is the contemporary reality that many economists around the world has been skeptic about, China in essence holds the deepest ingenuity when it comes to prehistoric, dramatically impressive architecture that has survived to this very day and undeniably would outlived many of the hands that has auspiciously worked on it. The marvels of China’s historic bridges are few of the occasionally written about architectural wonder. Long before modern engineers and architects has exploited arithmetic and Science to measure strength of materials and feasibility of building elements, the Chinese craftsmen has by this time tested the character and nature of pure matters and has fashioned forms and structures unknown to the West. Many of these primordial bridges have stood the test of time and are still being utilized efficiently and have survived until this very day. Ronald G. Knapp is a passionate author that has done years of extensive research about Chinese culture and has dealt notably profound about Chinese Architecture. In his book CHINESE BRIDGES: A LIVING ARCHITECTURE FROM CHINA’S PAST, he explored the rich history and memoire of the each of the bridges he featured in his book. Bridges are compelling metaphors of any known culture; the Chinese for one has numerous maxims that merit the importance of this physical connection of one border to the other. Ronald G. Knapp has commissioned Chester R. Ong, an accomplished Photographer based in Hongkong to photograph these dramatic bridges that represent the compelling architectural prowess of Ancient China. These collection of photos are presented in a paperback that will serve as remembrance of China's glorious past and an opulent source of information on how multifaceted Chinese engineering and architecture have been way before modern cranes and gantries came as a staple of bridge construction today. 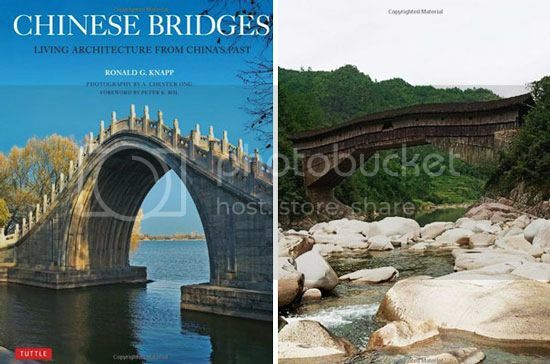 Getting a copy of Knapp’s book CHINESE BRIDGES: A LIVING ARCHITECTURE FROM CHINA’S PAST is a must for anyone who has passion to create living utilities such as bridges that are far from mundane and conventional.